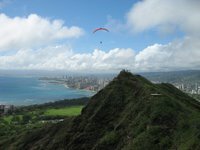 Today a bunch of us flew at Diamond Head in varying conditions, light to moderate south and southeast flow. A really great day of flying, especially after getting skunked the day before. Several of our prodigal sons from Seattle are back for a visit: Motorhead Paul and Scot both flew with us out there, along with Bruce from Denver who has visited us before. After landing I spoke with a nice DLNR officer who had come out specifically to warn us not to hike and launch from the crater above the road. The crater is in the jurisdiction of the State Parks division, and we do not have a permit to launch there. The State Park rules require a permit for aircraft to be launched or landed in their parks. Pilots who continue to launch from the crater will face fines and confiscation of gear. Please refrain from hiking above the road and launching from the crater. Thank you. I guess being one of the many homeless up there is somehow okay. I can see plenty of spiff oceanview compounds from the air, ironic. I guess I could understand, homeless people aren't as much fun. Gee firedave. One of those spiff oceanview compounds is mine and let me tell you, I am loads of fun.